It’s like taking a few pages from the 1970s cookbooks of Freddie Hubbard and Miles Davis, adding one’s own recipes and coming up with something that is at once familiar yet very different. 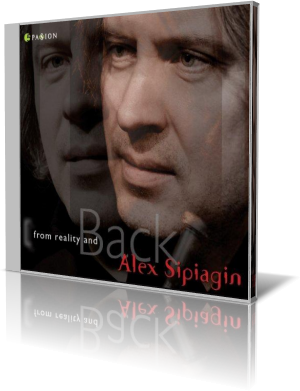 Trumpeter Alex Sipiagin’s From Reality and Back (5Passion, 2013) gives that impression. With Sipiagin are Dave Holland, double bass; Antonio Sanchez, drums and percussion; Seamus Blake, saxophone; and Gonzalo Rubalcaba, acoustic and electric pianos. “Around the Bend” is an ambient, free-flowing piece. All five players get moments in the spotlight, but it’s their cohesion as a unit that carries the overall piece. Rubalcaba’s electric piano is one part Chick Corea, one part Eumir Deodato and one part Michael Bluestein. However, Sanchez nearly steals the show during the keyboard solo. Sipiagin and Blake blend beautifully during the melodic passages, mixing overlapping phrases with unison. “End of …” sets the listener up. It begins slowly, quietly and about two minutes in, it stops. The pause is brief, as the musicians kick it into high gear. Trumpet and tenor take the art of call and response and turn it into an all-out duel. The horns then take a break, stepping back for piano, bass and drums to engage in their own battle royal. There’s one extended stretch where all three instruments appear to be “the” solo instrument with the other two providing accompaniment. The end of the song is highlighted by the flaring horns. Sipiagin was born on June 11, 1967, in Yaroslavi, Russia, a city 150 miles from Moscow and home to one of Russia’s most famous opera singers, Leonid Sobinov, who is Sipiagin’s great-uncle. At 12, Sipiagin began playing in a children’s orchestra. After entering a local music college at 15, he was introduced to and inspired by what few, and rare, tape recordings available in Russia of bebop and other jazz music. That led to further study in Moscow, including classical training, pop gigs and recording sessions. As a professional, Sipiagin has performed or recording with an array of jazz and non-jazz artists. Among them are Gil Evans Band, Michael Brecker, Eric Clapton, Dr. John, Aaron Neville, Elvis Costello, Michael Franks, David Sanborn, Phil Ramone, Dave Holland and the Mingus Big Band. From Reality and Back is Sipiagin’s 13th release as a leader and his first on 5Passion, which is Rubalcaba’s label.